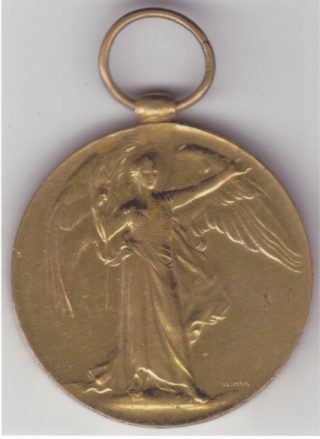 At an MNS April meeting in 2010 a member showed a common World War I service medal and some medallions he had bought at a garage sale about 10 years earlier. Included was a bronze coated Victory medal that was awarded in the millions to all soldiers who served in the British forces during WWI. At first glance this is a Victory medal, one of millions issued. However the edge impressed with 384 L-CPL. A.S. BURTON. 7 BN. AIF.” makes it a One in a Million find. However each of these medals is unique as it has the details of the recipient impressed on the edge. In this case it was “384 L-CPL A.S.BURTON. 7BN. A.I.F.” Another member who was more knowledgeable suggested that this Australian soldier had an early enrolment number in his battalion and may have served on Gallipoli. Subsequent research in the War Memorial archives showed Alexander Stewart Burton did indeed serve in the Gallipoli campaign. However he was not to return to Australia and wear his medal at Anzac Day marches. Only 22 years old he was killed in action at Lone Pine on 9th August 1915. Moreover for his heroism in that action he was postumously awarded the Victoria Cross, one of only 9 Australian VC’s from Gallipoli. Our member went to Euroa (Vic) where Alexander has grown up and met with some of his descendants to tell them of his discovery. All 9 Gallipoli VC’s, including Alexander’s had been acquired by the War Memorial in Canberra over the years. They were accompanied by the service medals ie 1914-15 Star, British War Medal and Victory Medal for all the VC recipients, except for those awarded to A.S. Burton. The Victory medal was donated by our MNS member to the War Memorial at a special ceremony. It now rests alongside the VC. What an amazing discovery! Of the 6 million Victory medals awarded, that such an iconic piece of Australian military history should be presented at MNS where its true significance would come to light. Of course the remaining medals awarded to A.S.Burton, 1914-15 Star and British War Medal are yet to be found. We can only hope they are still out there awaiting discovery. This is a great story – a special and rare piece of Anzac history found in a Victory Medal.